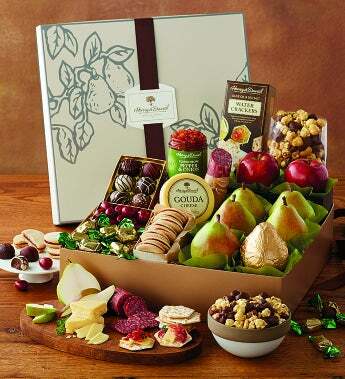 They won’t be able to get enough of the great snacks inside this delectable gift box! Filled with plenty of Harry & David® favorites like ripe, juicy Royal Riviera® Pears, handcrafted Moose Munch® Popcorn and savory cheese—there’s something for everyone. 5 Royal Riviera® Pears; approximately 2 lbs. 3 oz. Milk chocolate Moose Munch® Gourmet Popcorn; 6 oz. Olive oil and sea salt water crackers; 4 oz. Pepper and Onion Relish; 10 oz. Milk Chocolate Mini Mints; 2.43 oz. Total Net Weight: 6 lbs. 2 oz.